This image recalls the images you can see behind your eyelids when your eyes are closed. You can almost see the veins and blood vessels, the light from behind your closed eye reflecting inward. This space represents our vision in a different way, suggesting that it still exists devoid of the outside world, that our eyes are capable of seeing in different ways. This vision is accentuated in certain yogic practices and meditations. Gaze upon the painting and then close your eyes and see it within yourself. 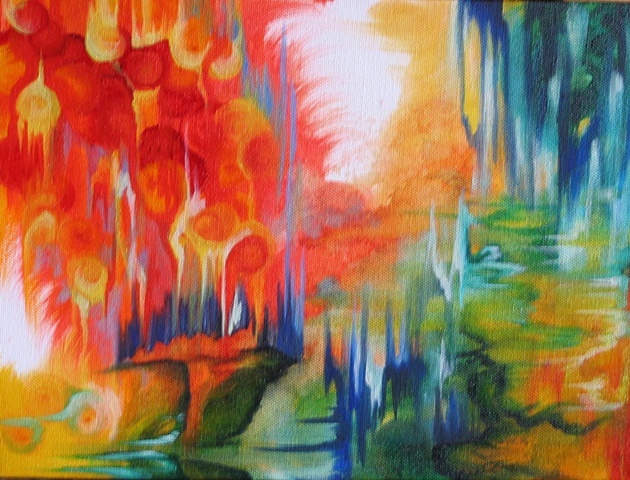 I use abstract paintings as a way to create stream of consciousness images. My work is usually very detailed and hyperrealistic and these give me the ability to break out of that form. They've become my way to express different states like right before you fall asleep, where images blur and ideas become color and feeling. They are my meditations, my free-form creations that take on a life of their own.